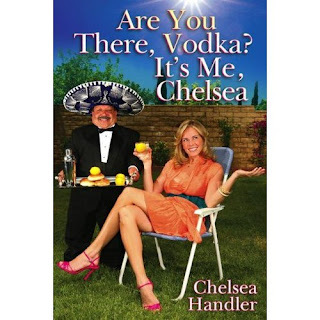 Chelsea Handler has had quite a life, and lucky for us, she is willing to share some of her stories in Are You There, Vodka? It's Me, Chelsea . In this mixture of memoir and humor, stand-up comedian Handler tells stories of her life. Stories about of the men she's dated ~ including the guy who got a little too much enjoyment out of helping her on a dog-sitting job. Stories about her father, who quite clearly has led her to drink. And many other stories that will have you cracking up. Chelsea Handler's previous book was My Horizontal Life: A Collection of One-Night Stands , so it's clear she's a pretty raunchy author and will definitely offend some readers. But I found Are You There, Vodka? It's Me, Chelsea laugh-out-loud funny. Literally. I got a lot of strange looks from my husband as I laughed along to this book. If you're a fan of Chelsea Handler's standup comedy, or her old show Girls Behaving Badly, you will definitely enjoy this book. And if you're looking for an easy, funny and quick read, I definitely recommend it...as long as you don't get offended very easily. This should make for an interesting book club discussion in a few weeks! This review was written based on a copy of Are You There, Vodka? It's Me, Chelsea that I borrowed from the library. She cracks me up. I loved this book. I love humorous books! Great review! This sounds funny! Thanks for the review-I've wondered about this title. I just became a new follower.